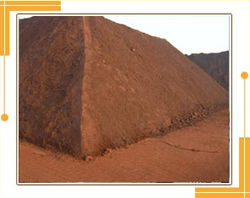 Leading Manufacturer of Iron Ore from Udaipur. Arihant Group has been leaders for last 25 years in the Quarrying, Processing and Exporting & Importing of marble, granite, other natural stones & Iron Ore Fines & Lumps with a record turnover catering to the demand of more than 30 countries across the globe. Arihant Group has one of the biggest mining networks in the south India region combined with its trustworthy logistical infrastructure is equipped to handle and provide multiple vessel loads of raw material supplies to its overseas clients on a consistent basis. Arihant Group owns its stacking facilities at Mangalore and Krishnapatnam port (6000 sq. mtr.). Iron ore after being transported through rail racks and dumper trucks reaches these stacking bays and from here it is then loaded onto the chartered vessel for the final journey to its overseas destination port. Our quality sampling and certification is done by SGS, S.K.Mitra or any other Internationally reputed company. Given below are the general specifications of quality standards for physical and chemical properties of our exportable Iron Ore Fines. : 63.50% basis / 62.50% min. Free moisture loss at 105 degrees centigrade 8% max.